07:00 We caught our 45 minutes flight to Durban. Catching an early flight is always a struggle and this was no different. I arrived at the airport with just five minuets to spare. 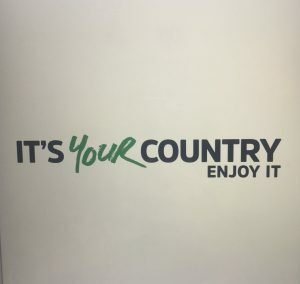 On arrival at King Shaka International Airport we were met with friendly guides, whose mission was only to show us the good time. 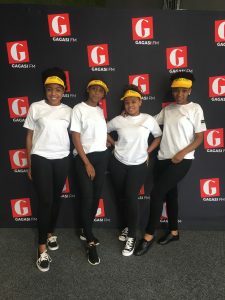 We then proceeded to the Gagasi FM Studios for an activation in preparation for the Beach Festival the following day. A lot of prizes were won by the listeners who visited the studio that morning. 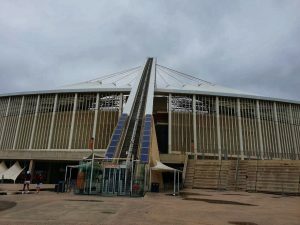 12:00 We went for the Moses Mabhida Sky Car adventure but unfortunately it was not in operation on the day. I was so sad because I was looking forward to it and swinging on the World’s longest swing. The sky car offers you a great view of the city while having the time of your life. 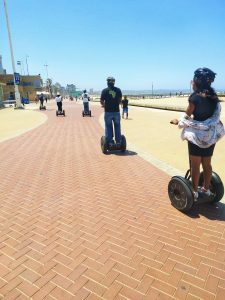 12:30 Segway Beach Gliding Tour is one of the exciting things everyone should try when visiting South Africa’s play ground (Durban) beaches. This will make you the envy of the whole beach strip. These can be booked at the Segway shop in Moses Mabhida Stadium and can be enjoyed by all from as little as R250 for a whole 45 minutes and R400 for two hours. We had a great time gliding along the beach to the South Beach pier and back to Moses Mabhida. 14:30 Durban is not shot of places to excite your pilate, I still wonder why it’s not called the ‘Food Capital. For our first meal in the city we went with California Dreaming where we were spoilt for choice. 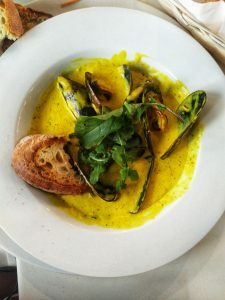 I have a tradition of always having sea food each time I visit the coastal regions to enjoy the sea goodies straight from the source. My love for Thai food always pops up, as it influenced my choice here as well. The food was great and the portions were very healthy. 16:00 The picturesque Valley of a thousand hills is rich with history and is a must visit to learn more about the people of KwaZulu Natal. After you have taken enough pictures you might want to make a turn at Phezulu Village for a Cultural Experience, some good music and traditional dancing. 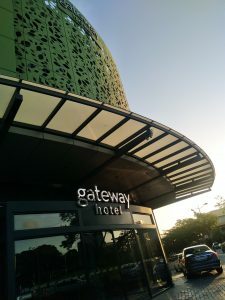 18:00 Time flies when you are having fun, in no time it was time to go back to the city to check in, freshen-up and go for dinner before hitting the streets of Durban for the night life experience. 22:00 it was time to fasten our dancing shoes and get ready for a long night of club hopping, and club hopping we did. We went from Cubanna to Butcher boys and finish off at Keys. We danced until we all agreed that it was time to call it a night at around 01:00 , as the following day was also another day of beach partying. It’s always better to start your day with an excesize no matter how big or small. Always carry you running shoes and a pair of tights and a sweater with. Go for a walk, jog at the beach promenade. Just get that adrenaline pumping and that blood flowing. 09:00 the crew fully understand the saying that “breakfast is the most import meal of the day”, so everyone had breakfast and decided to chill around the hotel for a bit to thoroughly explore and enjoy its amenities. 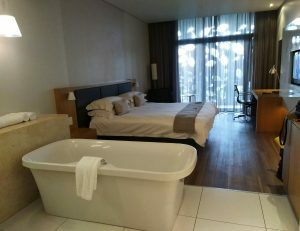 11:00 What’s the point in going for hotels with winning amenities if you are not going to indulge in them. After Breakfast we decided that it makes sense to go and have fun at the roof top pool area. While others were busy having conversations over drinks, some of us decided to take a dip in the pool. Pssssttt… “Girls, you can never be caught off guard, always stash a swimming number in your bag”. After we had had a great time swimming, we were now ready to go to the Bay of Plenty for the annual Gagasi FM Beach Festival, but our first stop was lunch. 14:00 Have you ever been at a place and you got nervous not knowing what to expect? That was me when sitting at Circus Circus beach restaurant. Boy, did I get the surprise of my life. The food was so good you could not just be satisfied with your own plate, you had to steal bits from others too. This restaurant has the best food by far. 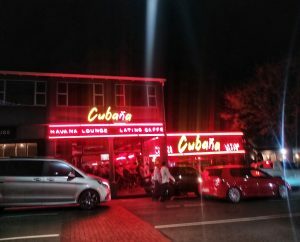 I know I am not qualified to say but I am going to risk it and call it, and say the ‘best food on the Durban Beach Front’. 16:00 After lunch we went straight to the festival, we danced our feet hurt. My highlight was having artists like Zakes Bantwini, Elvovo and Professor take us down memory lane with their award winning hits. The festival had headliners such as the likes of A.K.A, Sjava and Mlindo the Vocalist. 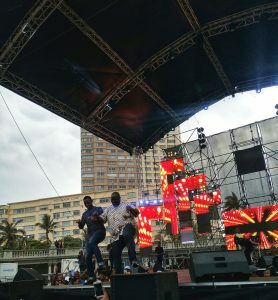 The rain tried its hand on us but failed as Durban Music Lovers did not even flinch. That is the one thing I know first hand about Durbanites, I have travelled to a few concerts in Durban from Johannesburg and the rain becomes a non-factor when people are hungry for good music and a good time. 22:00 When everyone was ready to go home, our shuttle was waiting on the roadside, so we hit the road. After having our late take away dinner we called it a night. 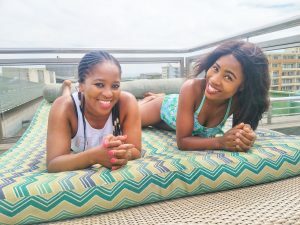 After having the ever so scrumptious breakfast at the hotel we headed straight to the airport as it was time to fly back to Jozi, and that was how we wrapped up out time in Durban. 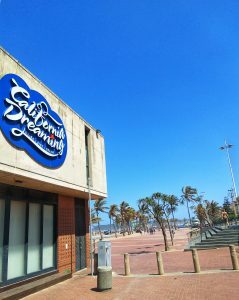 • Durban and KZN in general has a lot to offer, be open for a great time. 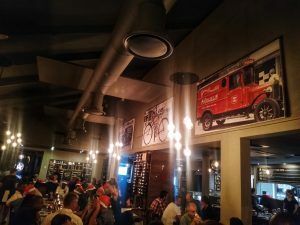 • The Chefs in Durban are there for you, explore the food scene. • They do not call it South Africa’s play ground for nothing, Durban always deliver on its promise in offering you the best activities to make your visit the greatest experience ever. • The transport system is world class and there is no place that is unreachable. • The people of KZN are very warm and are not shy to share their history with you, as this gives them an opportunity to bask in pride. • KZN is rich in history and there are a lot of information centres that one can consult to get more information.